Some days we do projects that I don't like very much... but my son was adamant that we do a letter project for the letter D and he wanted it to be a dog. I wasn't feeling very creative, so this is what I came up with... it still helped us work on the /d/ sound though and he liked it a lot... though he wanted to watch more than participate once we got started. 1. Draw a letter d. Talk about the letter name, sound, and key word. 2. Draw the letter d in the air and then trace it on the paper. 3. Cut out several brown ovals. We also talked about the oval shape. Oval is one of his favorite shape words. 4. Glue the long ovals on for ears and short oval for the mouth area. 5. Add googly eyes and color the face with a brown crayon. At this point my little guy said, "you can finish the project, I want to go play bowling." 6. Add a pom pom nose. I would've rather done a black nose... but I only had a light brown pom pom. 7. Cut some red paper to make a tongue and glue it on. 8. Write the word dog at the top of the paper. Use foam letters and match them to the word at the top of the paper. This is where my little guy came back and wanted to participate again. He loves spelling and matching letters. 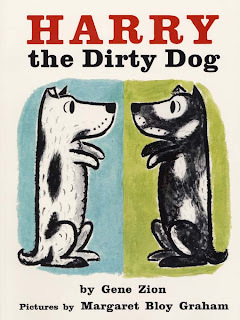 Harry the Dirty Dog by Gene Zion is a favorite dog book at our house... and a fun one to read along with this project. Harry the Dirty Dog is one of our favorites, too. That's a fun D craft. Very cute nose.